Mr. Meeseeks lives to help out! It doesn’t matter whether that means helping out with some chores or helping Summer become more popular at school. You see, the baby blue creature actually LIVES to serve. That’s why each Mr. Meeseeks approaches everything in life with a “can do” kind of attitude. You know who else has that kind of attitude? Your teen! Yes, your teen can complement their “can do” kind of attitude with a look to match. When they become the Rick and Morty character, your teen will feel like they can accomplish anything! They may even feel ambitious enough to help complete the impossible task of shaving 2 strokes off of Jerry’s golf game. If your child watches Rick and Morty, then this teen Mr. Meeseeks costumes is the perfect outfit for your child to wear. It comes with a comfy blue jumpsuit made of soft fabric. The sleeves end in blue mittens and the legs end in convenient boot covers that let your teen wear any pair of shoes with this costume. Of course, the best part about this costume has to be the mask! 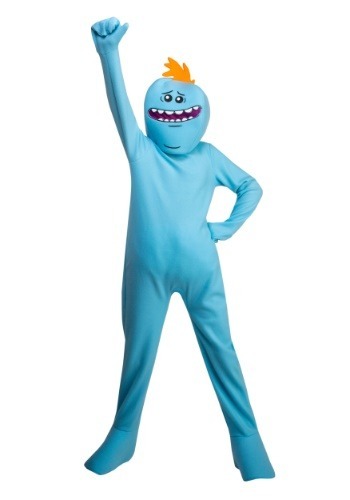 The mask has Mr. Meeseeks’ lively face printed on the front. It even has a small mesh screen in the mouth so your child can see comfortably out of the mask. Finally, a little tuft of orange “hair” pokes out of the top to complete the look. When your child assumes the role of Mr. Meeseeks, it’s a win-win situation for everyone. Just think about it for a second. You can request that his one purpose be to do the laundry, letting you get some much-needed laundry done, and your teen gets to be their favorite character from Rick and Morty. They’ll have to do it if they really want to play an accurate Mr. Meeseeks.